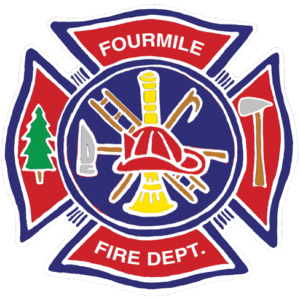 The Fourmile Fire Department has been serving our community for more than 50 years. We continue to be fully committed to providing you the highest level of protection and service when responding to fire, flood and medical emergencies. It is for that reason that we are writing you now: we are very interested in hearing back from you, regarding the future direction of the department. Our team is made up of 23 volunteers and three paid firefighters. We have four stations throughout the canyon and seven emergency response vehicles (three engines, two water tenders and two brush trucks). These resources are critical when responding to devastating disasters like the 2010 fire and 2013 flood; regional events such as the 2016 Cold Springs fire and the Sunshine fire earlier this year; as well as the ongoing emergencies like medical incidents, house fires, and car accidents. In 2007, the Board decided that paid daytime staffing during the week was necessary to respond to emergencies at times volunteers were most likely to be out of district at their day jobs, less available to respond, and when most the emergency calls occur. When do Emergency Calls to the Fourmile Fire Department Occur? The Department is funded by a property tax levy, the level of which was overwhelmingly adopted by voters in 2010. 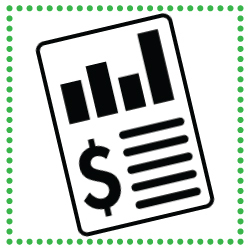 Our current rate is 12 mills (a mill is $1 per every $1,000 of assessed value, so owners currently pay $120 for the fire district for every $100,000 in assessed value). In the past, our budget has also been supplemented by federal SAFER grants and contract fire mitigation work. Starting in 2016, the Fourmile Fire Department was no longer eligible for SAFER grants and the funding for the contract fire mitigation work is coming to an end. Additionally, because of the Gallagher and TABOR amendments the department will be receiving fewer dollars from the mill levy in the future. 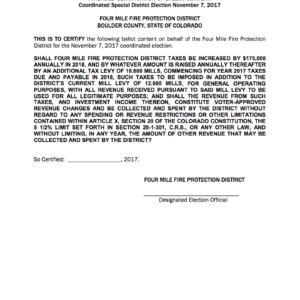 The Fourmile Fire Department Board is considering options to maintain a balanced budget while meeting the needs of the community. As the Board continues to review options and envision the future of the Fourmile Fire Department, we would like to involve the community in that conversation. As we deliberate this issue, we are very interested in hearing from folks across the community and are asking YOU for any ideas or input. The Board of Directors will be hosting an open house to gather your input on August 22nd from 6 – 8 pm at Poorman Station. You will also be able to learn more about the department and meet the board members and fire chief. You can also send us your questions and comments by replying to FourmileFPD@gmail.com. Want to Sign Up for the Next One?